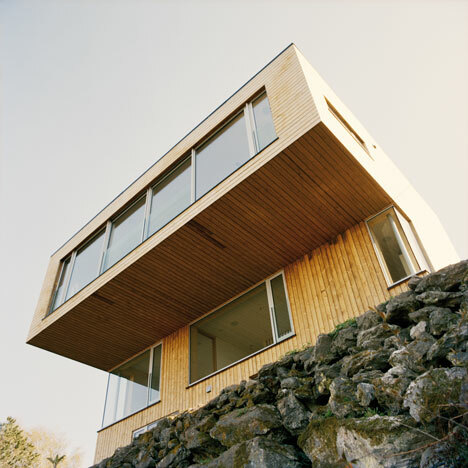 The top floor of this periscope-like wooden house in Stavanger, Norway, cantilevers northwards towards the sea. Oslo architects Element renovated the 40-year-old house in 2010, choosing to reconfigure the existing two lower storeys and to completely replace the original upper floor. A long window stretches across the entire width of the cantilever to provide a view across the water from the new open-plan living and dining room. Residents enter the house at this level, while the floors below step down in tandem with the steeply declining hillside. Photography is by Dinesen, apart from where otherwise stated. The existing house was built in 1969 as a "twin" to the neighbouring building. It did not function well to the demands of 2008-living, neither in the room sizes nor in their solutions, and it had generally a need for restoration work. Element, together with the client, has come to a solution where mainly the bottom two stories are rehabilitated while the top story is replaced with a lighter and more open construction which opens up towards a grand view of "Byfjorden." This is a big change from the earlier situation where it was necessary to go down a level to see the view. The volume on top is also pulled further away from the road to make room for a larger sun deck towards the south and to let more light into the building. This deck is also thereby sheltered from the northern wind. The architectural expression strengthens the qualities on the site and reflects its northern orientation. At the same time it respects the existing constructive principles. Sustainability: massive wood construction; reuse of the old foundation and walls.